The drone of a Korean documentary crew is buzzing above Alishah and Sajjad's heads as they go out for a run in the pristine, snow-covered woods of Switzerland. An Austrian news anchor has positioned herself between two ski slopes, microphone in hand, ready to catch the two athletes between practice runs. And in the lobby of the St. Moritz Youth Hostel, a Japanese journalist is nervously conducting an interview via Google Translate, since he neither speaks English nor Dari, Alishah's and Sajjad's native tongue. It is a dream they didn't even know they had a few years ago. "Coming from a small village in Afghanistan, going to the Winter Olympics was nothing I ever dared dreaming about. How could I? I didn't know such things existed, so how would I have imagined them?" Farhang says. Though their home province of Bamyan is spiked with mountains, they had never heard of skiing - until a group of European aficionados decided to put Afghanistan's mountains to use for something other than shepherds and insurgents. Upon first seeing the Europeans on the slopes in 2011, Farhang was perplexed, "I didn't know what to call the things they had on their feet." Neither did Husaini. "It was very joyful," he remembers his first experience skiing, "falling down, rolling around in the powdery snow." Athletically, they have been having a hard time, usually coming in last at the trial races. "When I feel disappointed, I tell myself: How could we possibly compete against athletes who have been skiing their entire lives? 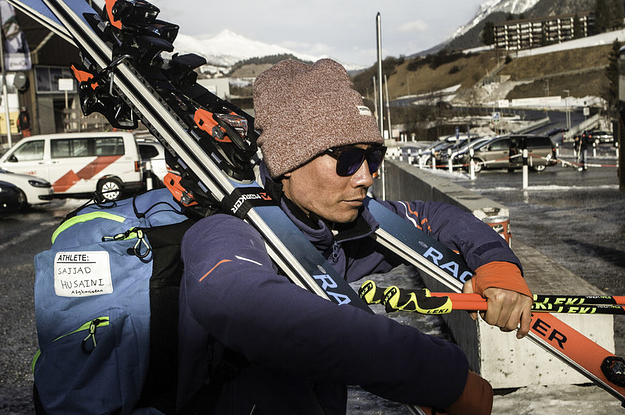 I have been on skis for a total of nine months," Farhang says. Seeing the training opportunities given to talented athletes in Europe can be frustrating for the young men, at times. There are no lifts, prepared slopes, or gondolas in Afghanistan. In order to ski, people have to walk up a hill and then ski down - often with wooden skis that people in Europe and North America haven't used since the 1970s. Farhang says, "You sometimes walk up for two hours just to ski down for five minutes. It's hard work." Despite having cameras following their every move, zooming in on their faces when they read yet another disappointing score on the board, the young men have decided to tolerate the constant media attention for one simple reason: They want to offer the world a different view of Afghanistan. "A lot of people are surprised when they first meet us," Husaini says, "they say, 'You are Afghans? But I thought all Afghans were terrorists or refugees.'" By mid-January, it is becoming obvious that the two men will not collect the points necessary to make it to the Olympics. However, they continue racing until the very end, having adopted the spirit of true athletes who don't give up even when the odds are against them. Their last chance to participate in the games, however, is now a letter from the Afghan President Ashraf Ghani, who asked the Olympic Committee to make an exception for Farhang and Husaini. After all, the Olympic idea is not one of winning, but one of taking part. The men are still hopeful. Farhang sums it up: "Making it to the Olympics would show people that Afghanistan is not just conflict. And I am sure it would inspire lots of young people in Afghanistan, as well as encourage the government to help more athletes. There is room in history for someone like us."